Welcome to the site of the cattery Siberian and Neva Masquerade cats in Italy "Gemme del Nord"! The cattery was registered in WCF in 2016 after the long story of love to this magnificent animals! Our cats live with us in the house as family members and it helps us in our intention to grow and to breed cats with a friendly temperament and good health! From Russia with love: an amazing native cat from the taiga of Siberia, a forest area with a harsh climate that no doubt transferred to this cat’s dense, protective and long fur! They have been known in Russia for hundreds of years , for they kind heart and love for people they are mentioned in Russian children's fairy tales! He loves people and want to be near their owners. He will follow you everywhere , he enjoys of your company , he will “help” and support you with all of your doing!They are real friends : loving , playful, trusty and attentive! He has a big heart as well as the country were he comes from ! They have natural good and strong health! The Siberians have a special affinity to the younger generation and will usually spend their days with the children of the family. They are quiet, proud and very clever animals. Well known that people who normally suffer from cat allergies are able to live with a Siberian Cat. If you choose a Siberian cat you will never regret it ! The Siberian, including the Neva Masquerade, has been formally bred in Russia since 1987 and the first standards of race has been approved in 1989 . 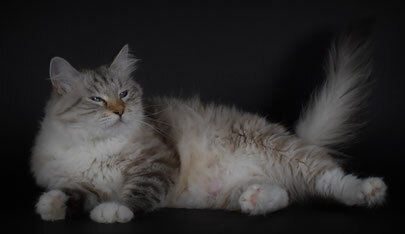 And in 1992 Siberian cat breed is recognized by WCF , registers their standards and in the same year the first Siberian cat participates in the international exhibition. Since that moment their popularity grows every year. At cat shows all over the world, the Siberian is drawing a lot of attention. The Siberian is a medium to large cat that can take anything up to 5 years to reach full maturity. It's substantial bone structure, broad chest and big paws give a general appearance of substance and strength – definitely a cat with 'heft'. All of this gives practically 124 possible colour variations! The pointed variety is named Neva Masquerade : the paws, tail and ears are dark and there is a dark mask on the muzzle. A Siberian Cat’s bright eyes greatly contribute to its alert, intelligent expression; they are large, slightly oval in shape but with a rounded lower line, set wide apart and slightly oblique. Eye colour ranges from coppers to greens, with blue being permitted only in the Neva Masquerade varieties. Siberian cats do not need a lot of grooming. But you have to brush them 2-3 times a week , to clean the eyes and to control the ears and teeth of the animal!
" Gemme del Nord " presents in Italy the cats of the best genealogy branches . All our cats come from a professional catteries in Russia and are direct descendants of famous catteris " Sineglaziy Angel ","Taiga Star","Barselit","Manchzhury"!